I surprised my family by making something totally new and different for dinner recently – butter chicken (recipe to post soon) and this cucumber yogurt raita salad. I have never tried cooking Indian cuisine before so I was excited to give it a try. 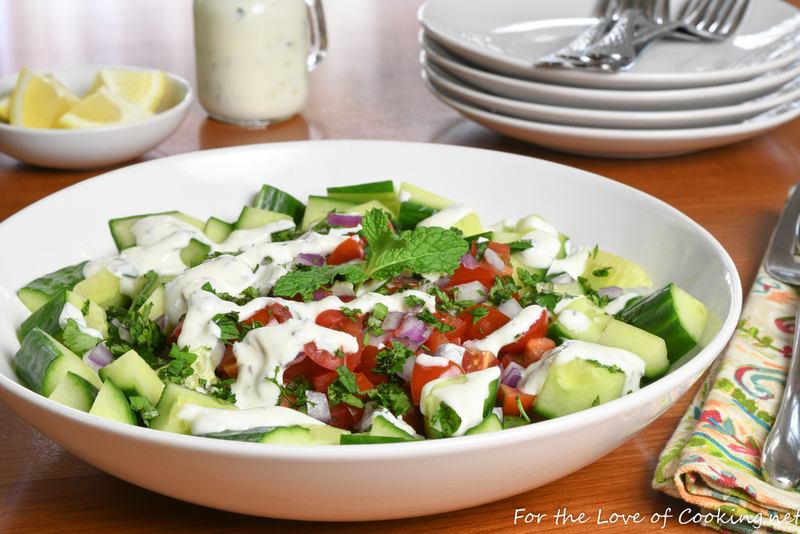 Cucumber raita salad was a popular choice when looking for side dishes to pair with butter chicken, and this recipe I found on Smitten Kitchen looked perfect because I had all the ingredients on hand. I love that. I tossed the salad together with the yogurt dressing right before serving and we all thought it was refreshing, delicious, and that it paired well with the butter chicken. Toast the cumin seeds in a dry skillet over medium heat, until fragrant & golden, about 3-4 minutes. Remove from heat to cool. Make the dressing by combining the yogurt, lemon juice, 1/2 tablespoon of cilantro, 1/2 tablespoon of mint, green chile, grated ginger, grated garlic, sugar, and sea salt, to taste together in a bowl; whisk until well combined. Set aside to allow flavors to mingle.